Biodiversity commonly refers to the distribution and abundance of plant and animal species within an ecosystem (US Forest Service 1989). Biodiversity provisions us with foods and materials, it helps regulate natural phenomena such as the water cycle, it inspires cultures to create art, and it supports vast ecosystems. In other words, biodiversity allows us to live healthy, happy, and productive lives. Unfortunately, we’re abusing this natural support system. As of 2009 in the US alone, more than 3,400 species of alien plants have invaded over 200 million acres. Over 40 million acres has been planted to lawns. Up to 33,000 species of plants and animals are now imperiled – too rare to perform their role in their ecosystem. One-third of our nation’s birds are endangered. We directly threaten biodiversity through habitat loss, spread of non-native species and diseases, and over-harvest. We also indirectly threaten biodiversity through pollution and climate change. You can play a part in protecting the biodiversity of your local community by creating backyard wildlife habitat that provides food, water, and shelter. 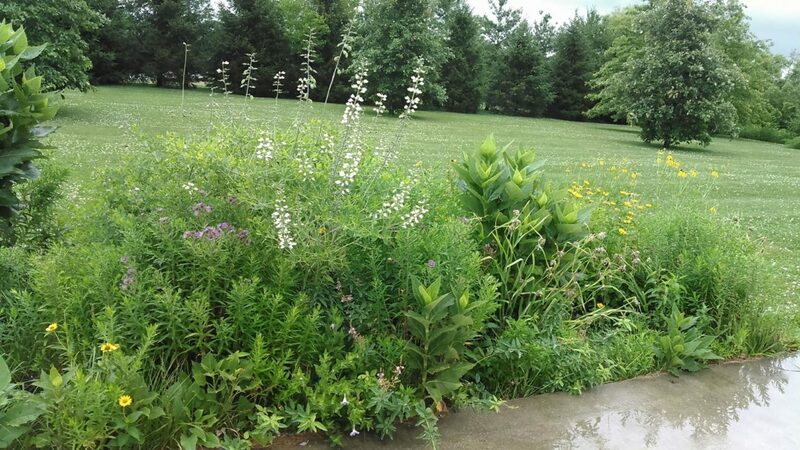 The core of your backyard habitat should be native plants. If you have enough space, native trees and shrubs are great! For smaller yards or even apartment patios, native grasses and flowers can provide food and habitat for birds, pollinating insects such as bees and butterflies, and more! The Coles Co. SWCD is selling a large variety of native plants through May 10th that can be used to create a biodiverse backyard habitat. Design help and other resources may also be available. Give us a call!